Thank you for posting that Steve! I wasn’t able to hear his message clearly over the radio, now I know what he said. He seems to be very humble, I am looking forward to learning more about him in the coming days. Great day for the Church. Too be honest, I thought the Cardinal too old but now a great choice! Very good to see Pope Francis is consistent with Roman Catholic doctrine. 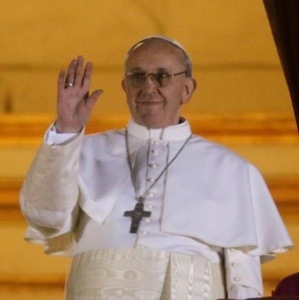 Interested in Pope Francis’ views about wealth and how to share that wealth with the poor. I wonder how this will play especially among those in capitalist countries who value wealth as a symbol of power and any sharing as a threat to not only their power but who they are.